Learning is something that I believe is one of the most important aspects of amateur radio…It seems to easily capture the interest and enhance the creativity of young people. It also creates tremendous opportunities in so many academic fields and so many areas of learning. And it does all of this by bringing to life the science and teamwork that makes learning more exciting. Ham Radio also naturally spans languages and cultures as well as geographical and political borders. Through worldwide communications and events, it inherently promotes cultural awareness, cultural understanding and international good will. This creates the opportunities to make friends in any corner of the world, to practice a new language or to learn about foreign customs and lifestyles. Amateur radio can be used very smartly to improve learning and to spark the interest, imagination and creativity of students in many ways. It allows them to experience, touch, see and understand what they learn instead of just cramming in facts from books and lectures. Bringing amateur radio into schools is a great opportunity. 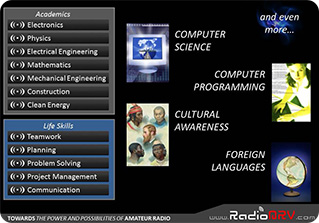 In fact, amateur radio has been integrated into school curriculums in many countries of the world and is creating great success in improving learning, motivation and results.